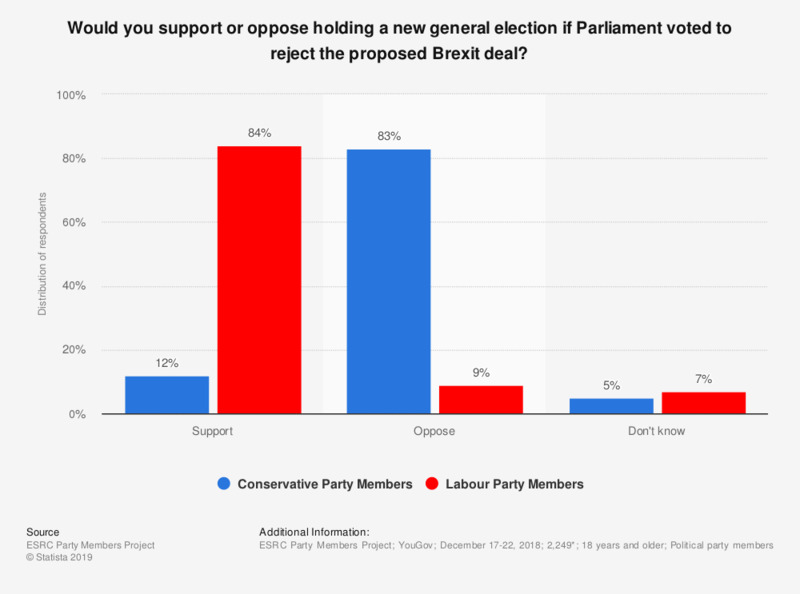 This statistic presents the result of a survey of members of the United Kingdom's two major political parties regarding their support for a general election if the Brexit deal is rejected by parliament. By a large margin, members of the Labour Party support the UK having a general election at 84 percent of respondents. * 1,215 Conservatives and 1,034 Labour. This question was phrased by the source as follows: "Imagine that Parliament eventually votes to reject Mrs May’s proposed Brexit deal...Would you support or oppose holding a new general election if Parliament voted to reject the proposed Brexit deal?". Would you support or oppose holding a referendum on the deal if Parliament voted to reject the proposed Brexit deal?